Publications and Reports, Resources, Use, application and Monitoring. Bringing Rome home. 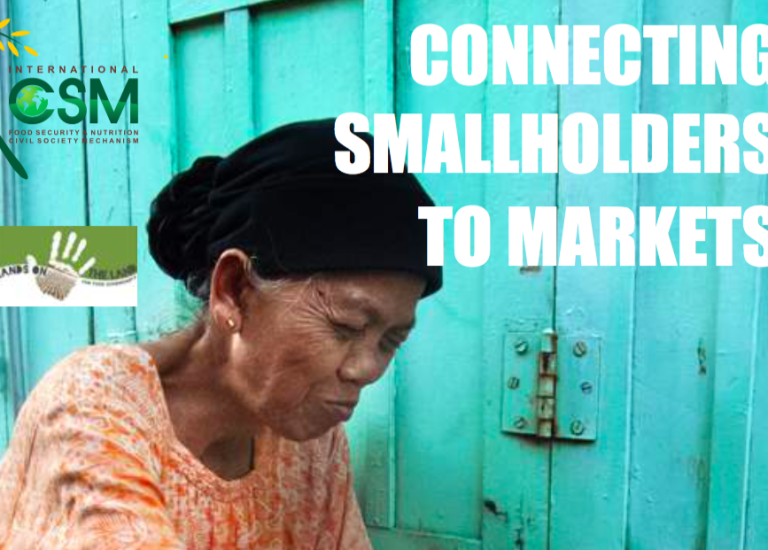 Connecting Smallholders to Markets’ is the title of policy recommendations negotiated on 8- 9 June 2016 in the Committee on World Food Security, the foremost inclusive international and intergovernmental platform deliberating on is- sues of food security and nutrition. Work on this extremely important topic has been underway since 2014. It has involved multiple rounds of for- mal and informal consultations, including most notably a High-Level Forum held in June 2015. The process has provided a welcome occasion for CFS members and participants to debate the issues and concepts involved, on which quite different understandings have been expressed. This work is far-reaching, and touches not only on specific topics such as food safety standards but also questions as fundamental as ‘What is a market?’, ‘In what kinds of markets are small- scale producers actually present?’ ‘Which mar- kets now channel most of the food consumed in the world?’ ‘What would constitute a positive way forward for relations between small-scale producers, markets and food security, and what investment and public policies would be needed to promote this?’. This analytical guide examines how small- scale food producers’ organisations and allied civil society can use the recommen- dations in their national and international advocacy and how they can work together with their governments to apply them in the context of national and regional policies and programmes. It argues that the policy rec- ommendations illuminate the relationships of smallholders to markets in two main ways: i) they recognize that the bulk of food is chan- nelled through markets linked to local, na- tional and regional food systems (‘territorial markets’), thereby clearly positioning these markets as foremost amongst different kinds of market systems in the context of food se- curity and nutrition; ii) they urge governments to employ public policy to support of these territorial markets, both by strengthening ter- ritorial markets where they already exist and by opening up new spaces for these markets to take root and flourish. With such an ap- proach, smallholders would be well equipped to meet global challenges ahead.